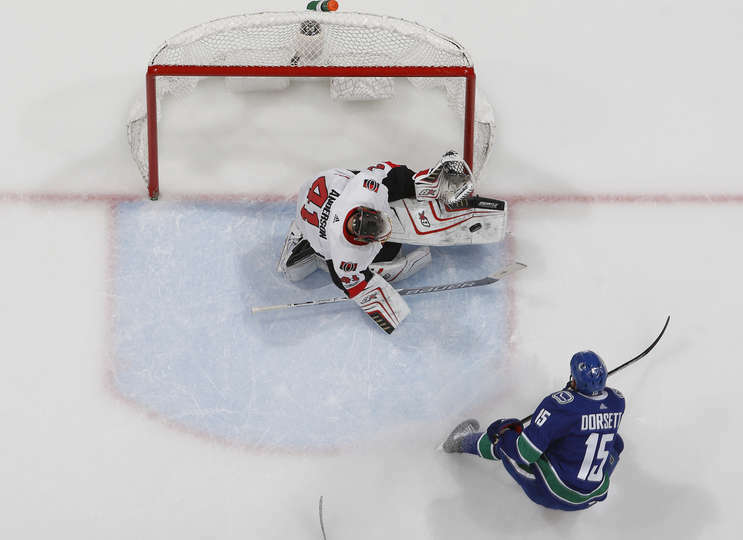 VANCOUVER — Ottawa Senators forward Mark Stone was playing close attention to Vancouver Canucks goalie Jacob Markstrom early in the shootout, and it paid off in the fifth round. Kyle Turris kept the shootout alive in the third round with a blocker side wrist shot, and Stone scored with a lower shot on the same side two rounds later to help the Senators to a 3-2 win at Rogers Arena on Tuesday. “You watch Bobby (Ryan) come in on the first shootout and (Markstrom) drops that right leg, and then Turris goes in there and makes a great shot and he drops the leg again, so I said ‘may as well go and see if he is going to drop it a third time,’ and fortunately he did,” Stone said. Stone put his wrist shot just over that dropped right pad to give the Senators their first win after losing their first two games of the season in shootouts. “It wasn’t Groundhog Day, so that’s good,” coach Guy Boucher said. Cody Ceci and Ryan Dzingel scored, and Craig Anderson made 26 saves, then stopped four of five in the shootout for the Senators (1-0-2). Markus Granlund scored in the first round for the Canucks. With defensemen Erik Karlsson (foot surgery) and Johnny Oduya (lower body) out, the Senators dressed seven defensemen, including rookies Thomas Chabot and Christian Jaros, and outshot the Canucks 42-28. Christopher Tanev and Thomas Vanek scored, Henrik Sedin had two assists, and Markstrom made 40 saves for the Canucks (1-0-1). Ceci made it 1-0 on Ottawa’s second shot 4:08 into the first period with a shot from outside the right hash marks that snuck between the glove and body of Markstrom and tricked in. Tanev tied it 1-1 at 7:03 with a point shot through a Vanek screen, and Vanek scored his first goal with the Canucks on a screen shot at 14:28 of the second period to make it 2-1. Dzingel tied it 2-2 at 5:09 of the third period. Ryan got a pass along the right boards and fired a perfect cross-ice pass through traffic to Dzingel streaking towards the back post. With 30 seconds left in overtime, Canucks forward Sven Baertschi had a breakaway but Anderson closed his pads in time to stop the low wrist shot. Trailing 1-0, the Canucks turned over the puck deep in their own end to create a 2-on-0 in front of their net 5:48 into the first period, but Markstrom stretched out to his left after a cross-crease pass from Tom Pyatt and made a fully extended glove save on a one-timer by Alexandre Burrows. Ottawa was 0-for-4 on the power play and is 0-for-16 this season. … Karlsson and Oduya are skating and could rejoin the team before the three-game road trip ends on Sunday. … Canucks rookie right wing Brock Boeser, who led the team with seven points (four goals, three assists) in preseason, was a healthy scratch for a second straight game.